This proverb reminds us how many times we have heard popular proverbs about water, and how many times we have seen advertisements to promote the great therapeutic properties of water. In Italy, it is easy for us to think of our daily water consumption – all we need to do is open a tap and we see fresh and clean water flow out immediately, ready for us to use. If we were to ask you how much water your family uses each day, you would automatically sum the amount of water used for cooking, bathing, drinking, housecleaning, watering the plants, … in other words all the domestic activities with a direct consumption of water. What if, instead, there was an indirect consumption of water, that we do not see? And if this water accounted for most of our water consumption? Water is considered a fundamental and primary resource, a human right, as proclaimed by the United Nations Organization (UNO) in 2010. Water is a resource that is essential for life and its development. We need water to drink, for our personal hygiene, to produce the food we eat, but also for our economic activities and to produce energy. Unfortunately. however, in some parts of the world water is a very scarce resource and only few lucky people have a water supply which is easy to obtain. In fact, it is estimated that over a billion people do not have access to drinking water and 40% of the world population lives in very poor hygienic conditions. 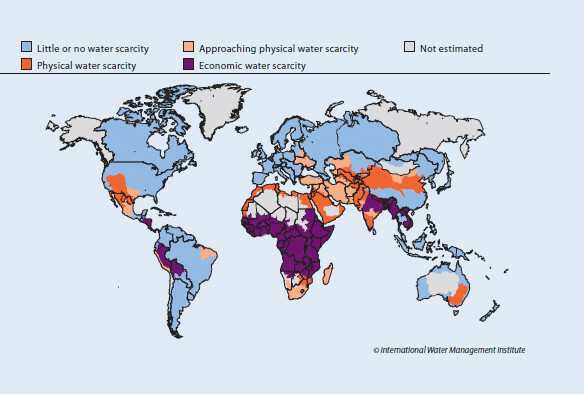 Many countries have already exceeded what is defined peak water, maximum sustainable water withdrawal. What is it that endangers the life of human beings? Water safety is threatened by the increase in the world population, climate change, economic growth and the increase in consumption, therefore it is fundamental to protect water even in those areas in which it can be found in great abundance. Fortunately, notwithstanding the pressure of some groups of interest, water and its trade are not exchanged as goods, and are not greatly influenced by the market, but this often encourages an intensive use that does not pay much attention to the resource, and leads to non-sustainable waste. Besides for our daily consumption, where is the largest consumption of water seen? The sectors with the largest demand for water, for the activities to be carried out, are agriculture, energy, industries, urban settlements. Agriculture alone requires an amount of water that is equal to 70 % of the total amount of water required by the mentioned sectors. According to FAO, in 2008, the demand of water for agriculture amounted to 2,743 km3 of water, i.e. the volume of water of Lake Victoria in Africa, and about 54 times the volume of water of Lake Garda in Italy! What follows, is that most of our water consumption is for water that we do not see, the water that is in our food. To manage water resources is a very complex, multidisciplinary matter, that requires the collaboration of a number of subjects: scientists, researchers and investors; it involves different countries, often disregarding national boundaries; and it also involves local problems that are dealt with on a global scale. International trade of goods implies that large volumes of water are transferred, water that has been used to produce goods and that is therefore virtually contained in the goods. In order to understand this need, let us take pasta as an example. Often pasta is produced in Italy, however not all the wheat required for the production comes from Italy, it is probable that a part of the wheat is grown abroad, using water resources of another country. This example can be applied to a number of products we use, and therefore it is important to enquire what are the implications and the impacts of what we choose for our wellbeing and to consider the relation between these and their impact on the fresh water systems. There is water, but it cannot be seen! What is a water footprint? What is its purpose? In Italy, the per capita consumption of water is 152 m3 a year. This amount however only regards direct uses of the resource, such as water for bathing, cooking, etc. It does not include the indirect consumption that we mentioned before. Where do we mostly find indirect consumption? How much does it amount to? Is indirect consumption only a small percentage amount or is it a greatly relevant amount? As already mentioned in the special reports on the ecological footprint and the carbon footprint, our actions provoke impacts that we cannot see: they are in some way hidden, but extremely real. The same thing happens when we refer to our daily consumption of water. The definition of virtual water is: the total quantity of water that is required to produce food, goods and services that we use every day. Take for example a beef steak: in order to produce the beef, cattle must be given water to drink and must be fed with fodder, which in turn may have required irrigation for its cultivation. Alternatively, think of the cotton T-shirt you are wearing, the cotton plant needs large quantities of water for its cultivation, and in order to turn it into yarn. Well, the concept of virtual water includes all these different types of water consumption that we do not see, but which are necessary in order to guarantee us items we require. In order to understand how we depend on water cycles that are even far away from us, and to understand what is the impact that our lives and activities have on the same, scientists have developed an indicator, the water footprint. The water footprint is an indicator that shows the consumption of fresh water, taking into consideration not only the direct use of water, but also indirect use, thus offering a more complete and detailed view of our consumption, an indicator that is an improvement on the traditional and limited concept of water withdrawal for direct use. This footprint is defined as the volume of fresh water that is necessary to produce a good, following the entire production line and the various production stages. It is a multi-dimensional indicator, i.e. it refers to evaporated water and water incorporated into a product. It shows the volume of water and the source it is drawn from, specified in geographical terms, and in time. The water footprint is generally subdivided into three elements: blue water footprint, green water footprint and grey water footprint. Blue water is fresh water found on the surface or underground (found in rivers, lakes, glaciers and the water table), it is easy to access and transport and can be channelled, pumped, measured, etc. According to FAO estimates, 70% of blue water on the planet is used for irrigation, but in some very arid countries this can even reach 90%. Therefore, we refer to the blue component of the water footprint when the volume of water is represented by the component coming from global resources of blue water. Water that comes from precipitation in the form of rain or snow is called green water. This water reaches the ground, but, instead of filling rivers or the water table, it is absorbed by plants and from there it evaporates or transpires. The green water footprint is the volume of water coming from resources of green water and it is equal to the volume of water that is contained in the plants, in the soil, or evaporated by the plants. Lastly, a third grey component is considered, to account for the dilution of polluting agents caused by the production processes (for example pesticides and fertilizers used in agriculture). 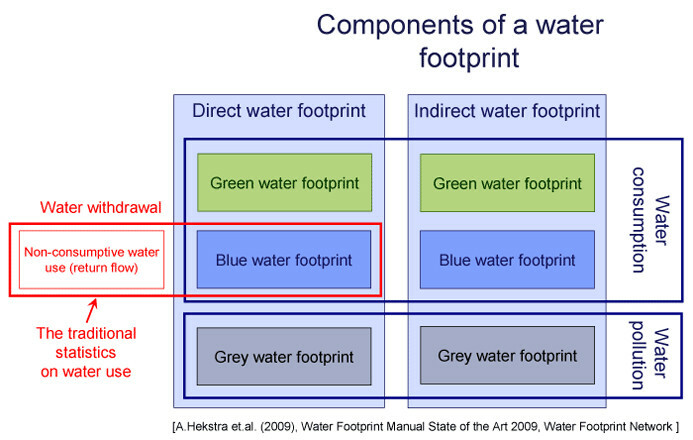 The grey water footprint is the volume of polluted water, i.e. the volume of water required to dilute the pollutants that are in the water, so as to respect the quality criteria, and for the water to be drinkable and safe. Lastly, there is still another characteristic that distinguishes blue water, i.e. blue water from a renewable or a non-renewable source. Renewable sources are those aquifers that are filled by precipitation, non-renewable aquifers have a very low percentage refill, and if these are exploited this would imply their rapid impoverishment. In conclusion, the water footprint, i.e. the virtual water content of the goods and services we use, is generally expressed in litres or cubic metres, and can be subdivided into the three components, blue, green and grey, and can be renewable or non-renewable, coming from areas that could be at risk of drought, or areas that are rich in water resources. From the point of view of sustainability, consequently, the same product can be very different in one case or another, with positive and/or negative impacts on man and on the environment, depending on the source where the water was taken. An orange that grows with only rain water will have an impact that is greatly inferior to an orange tree that is irrigated, perhaps from a non-renewable source, in an area with poor water resources. It is because agriculture requires most of the water resources, our eating habits greatly influence our personal water footprint. According to FAO, the mean number of calories consumed in the industrialized countries is 3,400 kcal, of which 30% is of animal origin. Products of animal origin require approximately 2.5 litres of water for 1 kcal of product, while products of plant origin require only 0.5 litres. As a consequence, for our meals we need 3,600 litres of water a day, which is a very large amount. Why is the water footprint of meat five times greater than that of cereals? Unlike what one may think, most cereals grown worldwide are not for human use, but to feed animals. The largest amount of water is required to grow food to feed animals. The largest amount of water is required to grow food for animal breeding, which is estimated to be 98%. The assessment of this amount depends on two factors; the specific requirement of water to grow the crop, and the actual availability of water in the ground where the cereals for animal feed are grown. Depending if the climate is mild or extreme, humid or dry, and depending on the type of crops, the water demand will be different. If precipitations provide a sufficient amount, rain water will be enough (green water footprint) otherwise it will be necessary to integrate the water supply by means of artificial irrigation (blue water footprint). Furthermore there will also be a volume of grey water due to the load of pollutants and pesticides that seep to the water table (percolating) or in the surface water (washing out). Therefore taking a look at the breeding farm, the water footprint of an animal will be obtained from the sum of the water footprint of the animal feed given to the animal, the water it drinks and the water to clean the premises in which it is reared, considering its age when it is slaughtered, and also its nutrition. It will therefore be very different if the animal was bred in the meadows, or with a mixed or industrial system, and if the area has abundant or poor water resources. It has been proved that any product of animal origin has a larger footprint than products of plant origin with the same nutritional value, managed correctly. For example, 1 litre of soy milk requires 300 litres of water, while 1 litre of cow milk requires over 900 litres. One kilo of beef requires an average of 15,415 litres of water, while 1 kilo of pulses requires 4.055 litres, however for the same calorie count, the value of the cow water footprint is ten times greater. Considering that meat consumption doubled from 1980 to date, and a further doubling is foreseen in the next 40 years, it is easy to understand how important and strategic it is on a global scale, to decrease consumption in the cattle breeding sector. 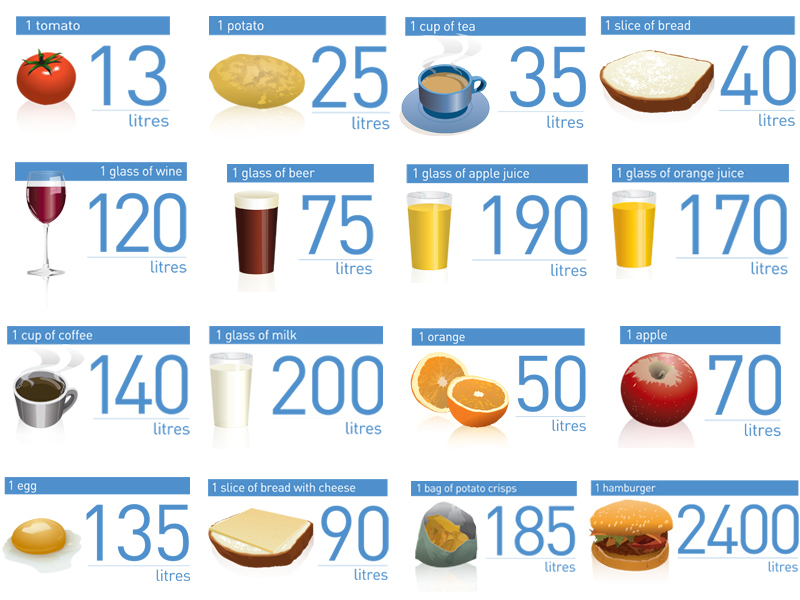 Check the mean water footprint of some of the more commons foods. Lastly, it is important to also assess how the food that we eat reaches our table. Food with a short production line, that is not greatly processed has a significantly smaller water footprint than other food. Products that require elaborate processing may contain more artificial flavours, while those which come from far off usually have a greater content of preservatives and additives. This is also the case of products that are packaged compared to those that are sold loose, and so on – therefore, the more food is handled, the more significant its water footprint, carbon footprint and ecological footprint will be. And you, how much water do you use a day? You can calculate the direct consumption and indirect consumption using the WFN calculator. never throw polluting substances in the sink (medicaments, used cooking oil, etc.). choose low environmental impact certified products, as for example Ecolabel products.